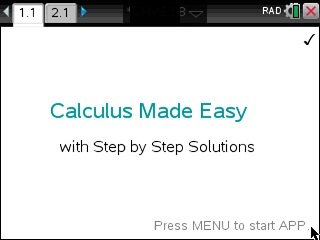 Calculus Made Easy is the ultimate educational Calculus tool. Users have boosted their calculus understanding and success by using this user-friendly product. A simple menu-based navigation system permits quick access to any desired topic. This comprehensive application provides examples, tutorials, theorems, and graphical animations. Just enter the given function in the provided dialogue box and learn how the correct rule is applied – step by step – until the final answer is derived. -Step by Step Implicit Differentiation and much more as can be seen in the videos.